Well, do not despair as the solution to all your Outlook PST file problem is very straightforward. The Total PST Repair tool for Outlook data file, not only repair corrupt PST files but, also recovers restores Outlook data items to different file formats like PST, EML, MSG or Office 365. 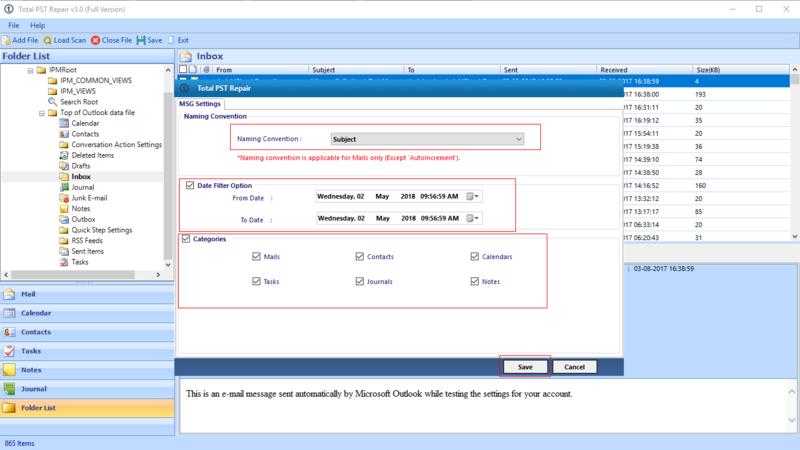 Supports PST in Outlook 2019, 2016, 2013, 2010, 2007 on Window 10, 8, 7 etc. 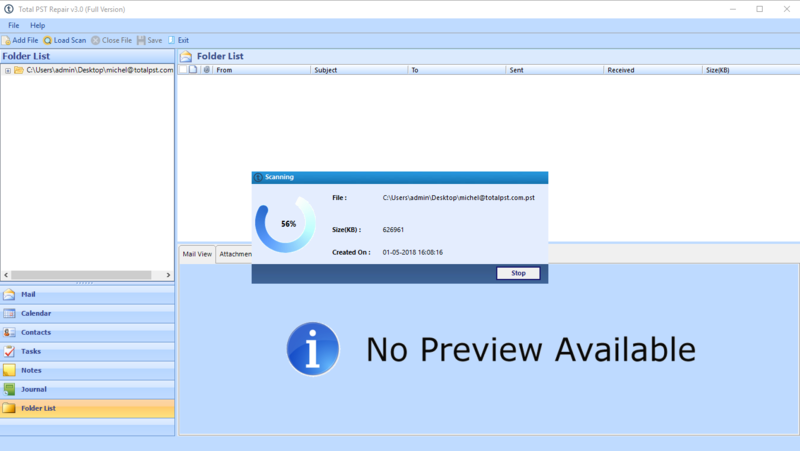 Demo Limitations - Trial version is safe to download and will save first 25 items. Using PST Data Repair software, the PST file issues can be fixed and data items can be restored. This Data Recovery tool is smart enough to recover permanently deleted Outlook data items from PST file. It provides advanced scan option to recover deleted data items like emails, contacts, calendars, tasks, notes, journals etc. And in case of severely corrupted PST file, the advanced mode can be used repair PST file. 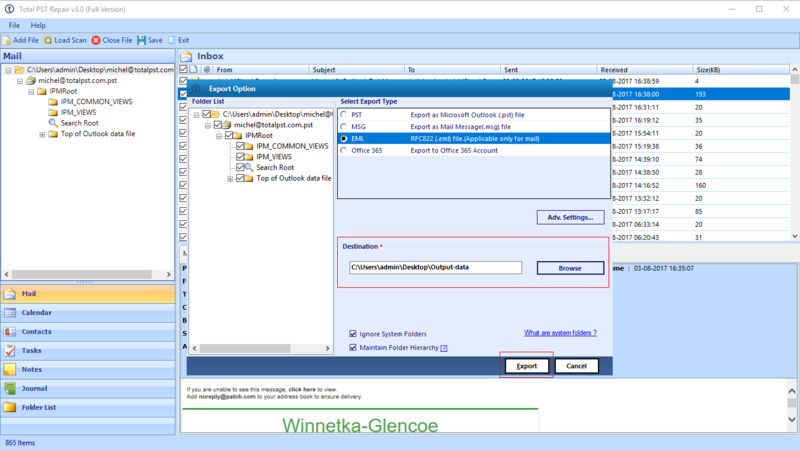 Once the Outlook PST recovery fix damaged PST files from Outlook 2019, 2016, 2013, 2010, 2007, 2003, 2002 etc., the Outlook data items can be restored in different file format like PST, EML, and MSG. 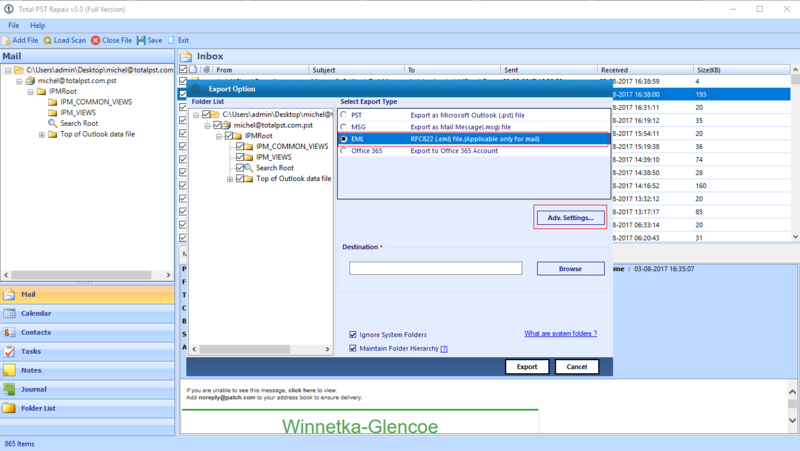 The application repair corrupted Outlook PST file and provides option to name the resultant file in the destination location while converting data in EML or MSG format. Total PST Repair tool provides "Recover Deleted Data" option to perform recovery of deleted emails, contacts, calendars, task, notes etc. 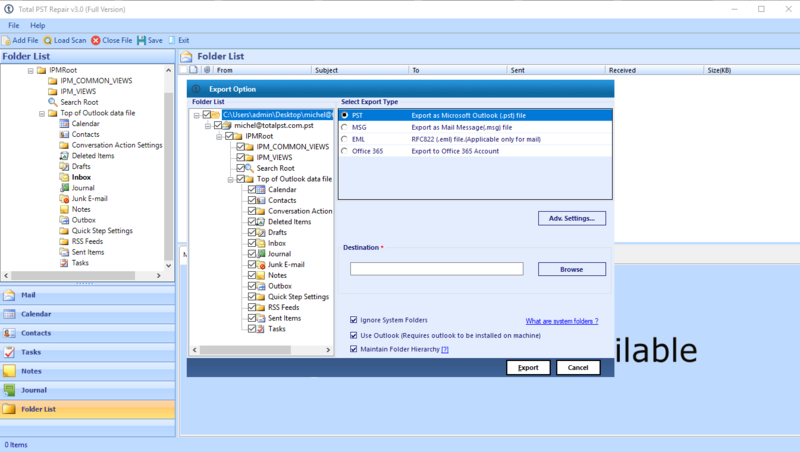 The software to repair Outlook PST file also provides some other features to manage Output file/ files such as date based filter, save selective data, it maintains folder hierarchy, Naming Convention, etc. These features will help to manage data on the local machine. Total Outlook PST Recovery software makes sure that the original formatting of the PST file will not be disturbed. Also, the meta-data property of the emails is kept intact even after the application repair corrupted PST file. 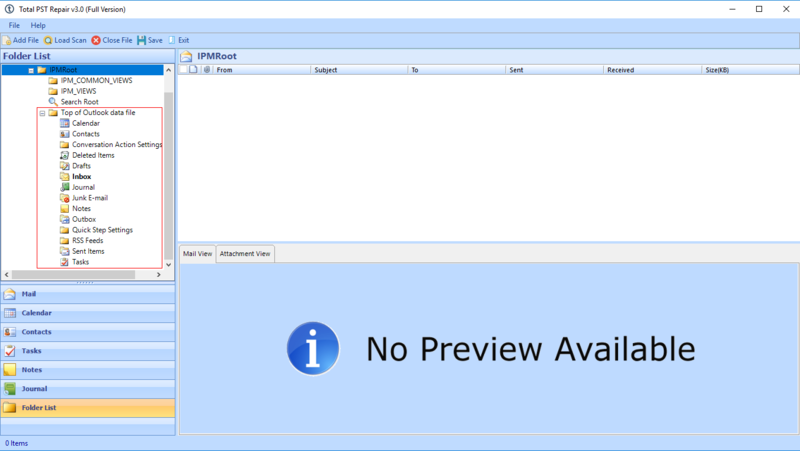 Not even a single bit is lost after using this Outlook PST Repair tool. Along with emails, attachments are also previewed. 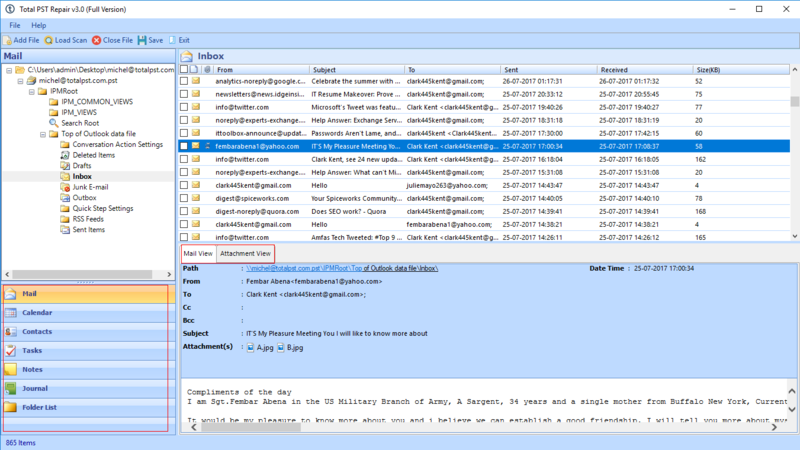 This software to repair Outlook PST files facilitates the user to save only selective amount of data by applying the date-based filter. All a user needs to do is enter the "to" and "from" fields. In this way, only selective amount of data is saved in locally and rest is rejected. 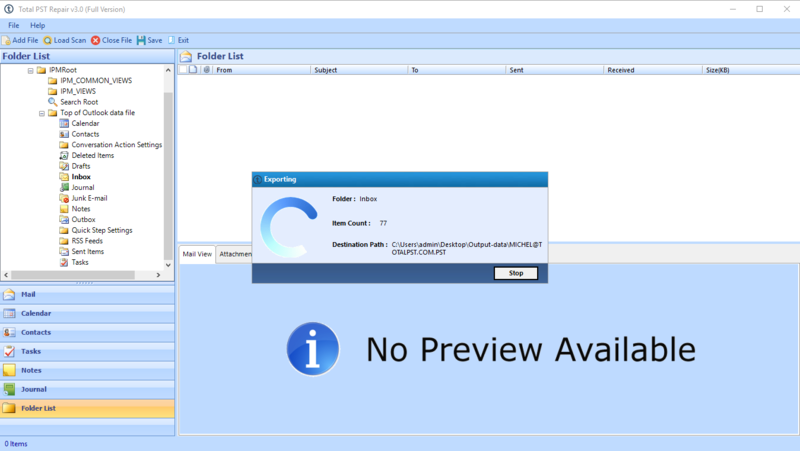 But the tool provides previews of entire data in PST file after completion of repair and recovery process. The PST Data recovery wizard allows the user to extract some selective amount of data after ‘repair PST file’ process from Outlook .pst file and recapture it in the healthy state. This Total PST Repair tool not only facilitates the user to repair corrupt Outlook PST file but, saves the robust data in multiple formats like PT, EML, MSG. 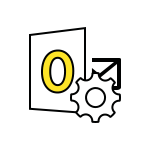 The Outlook Repair PST tool enables the user to divide the large-sized PST file into smaller fragments. In this way, the corruption of the Outlook database (or PST file) can be prevented. The user can select any size from 1GB to 45GB and obtain the smaller PST files that are easier to manage. 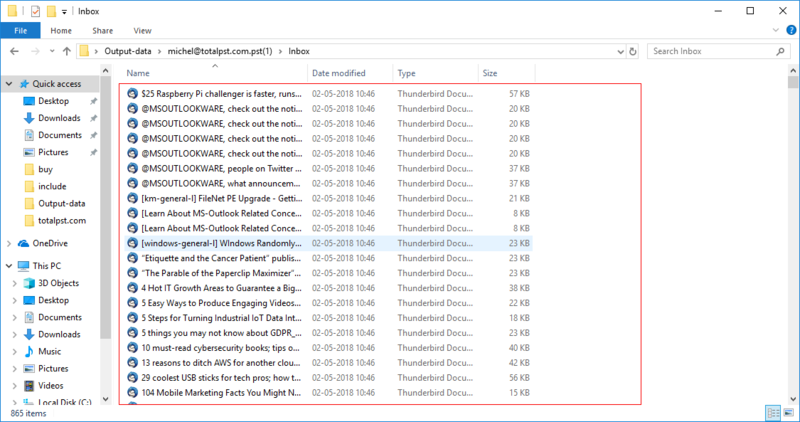 The repaired Outlook PST file can be uploaded to Office 365 account. The PST Recovery tool not only equips the user to repair PST file of Outlook 2016, 2013, 2010, 2007 and other versions but, also facilitates to import PST file in the Exchange Online account or Outlook 365 account without any issue. "When the error message reads: Cannot open your default e-mail folders. The information stored cannot be opened." "When the error message: Outlook Send Receive Error 0x800ccc13 prompts on the screen." "The PST File Repair tool helps the user to Resolve Outlook Error 0x800ccc79"
"Microsoft Inbox Repair Tool not responding. Issues in Repairing corrupted PST"
"Outlook PST File is not a personal Folder File. (Outlook.pst file name)"
"Cannot start Microsoft Outlook. 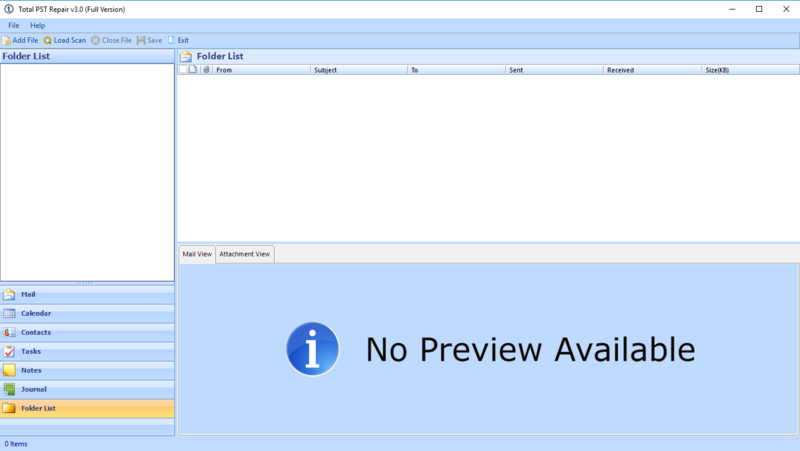 The set of folders cannot be opened "
Download demo edition of Repair PST tool is freely available. 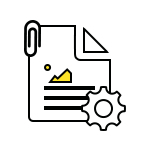 This demo version allows you to recover and repair PST file data items and previews entire data of PST file in software panel. But it only allows to save 25 items per folder locally. How to recover and repair PST file in bulkor multiple files together? 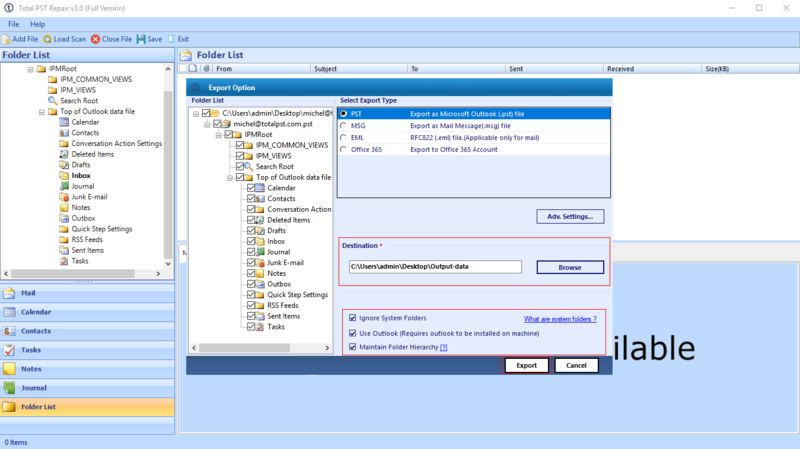 The Outlook PST Repair Tool supports to recover and repair corrupted Outlook PST files in batch. But it does not provide option to browse and select multiple PST file at once. User needs to load each PST files separately. The software will repair Outlook PST files one by one. But this PST Recovery software allows to export multiple PST files data items all together into different file formats. 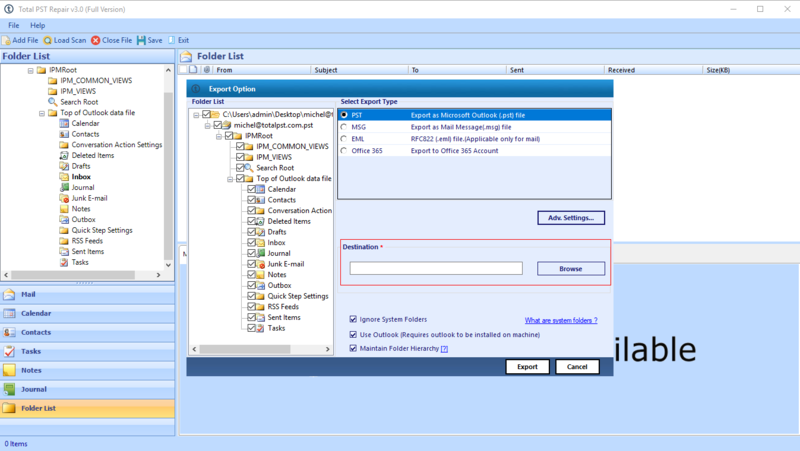 After repairing Outlook PST file, the resultant file will be obtained in which format? If you are using Total PST Repair software to repair Outlook PST file, the resultant file can be saved as PST, EML, MSG file format locally. 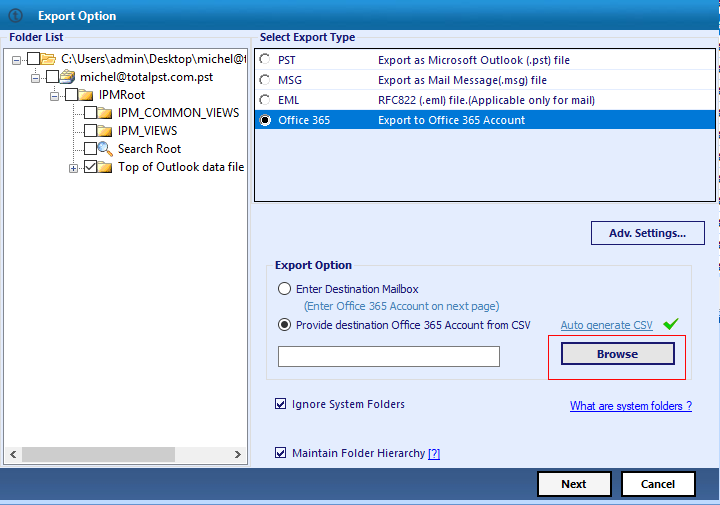 The user is also allowed to export Outlook data items to Office 365 directly. 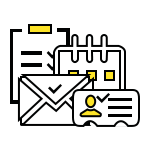 The PST file obtained will be in UNICODE format and supported in Outlook 2019, 2016, 2013, 2010, 2007, 2003 etc. How this utility helpful in repair .bak file created when scanpst.exe fails? Yes, this Outlook PST repair tool is helpful in repairing any sort of Outlook data file. Even hard deleted and password protected file can also be repaired. 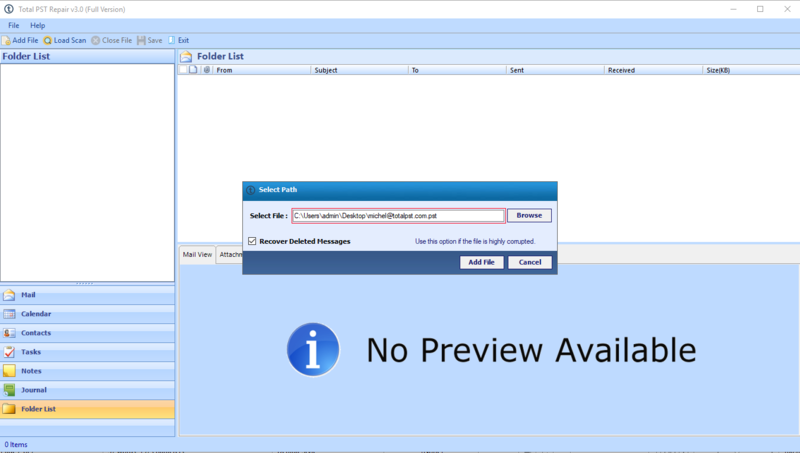 The Outlook.bak file created by Inbox Repair Tool can fixed by renaming it into Outlook.bak.pst file. Then repair PST file using the software as normal. 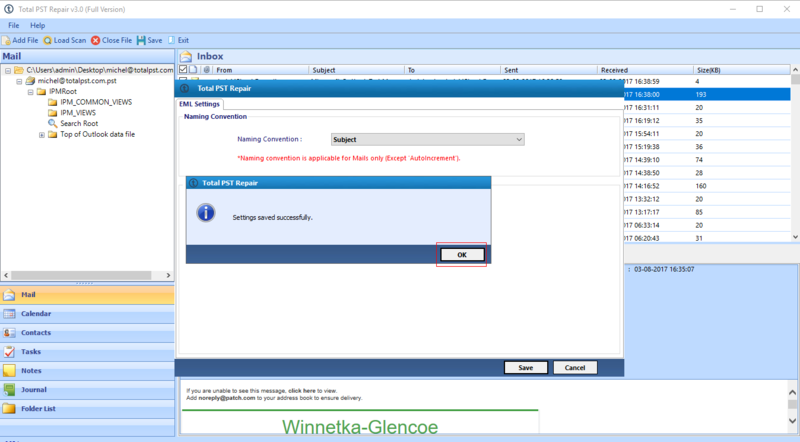 What is the file size limit imposed by Repair PST Tool while it repair PST file? There is no file size restriction is applied on Outlook PST Repair software. Infact the user can repair and recover Outlook PST file of any size irrespective of Outlook version also (Outlook 2003, 2007, 2010, 2013, 2016, 2019). 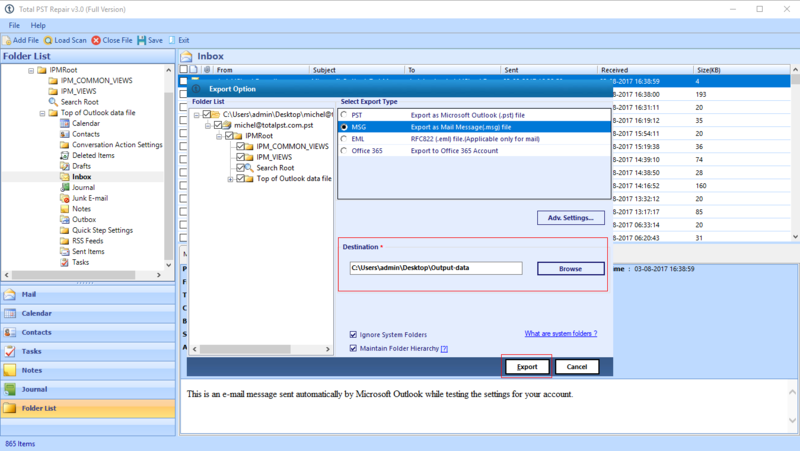 Also the tool provides option to select large PST file to repair and recover Outlook data items. 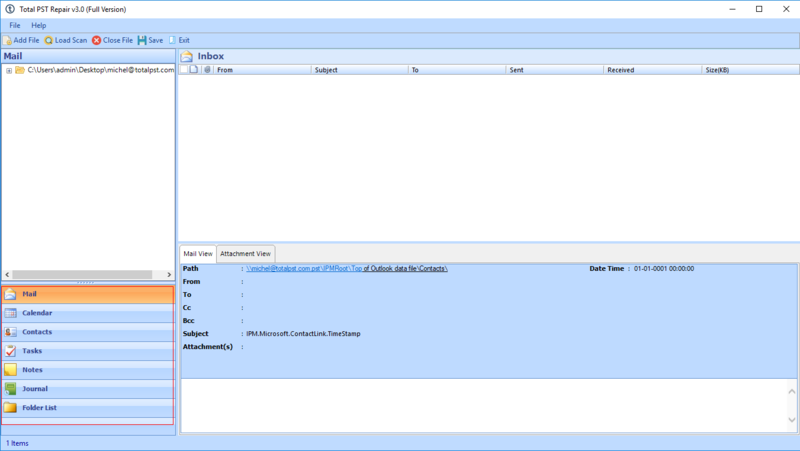 How to repair corrupted Outlook PST file using PST Recovery tool? 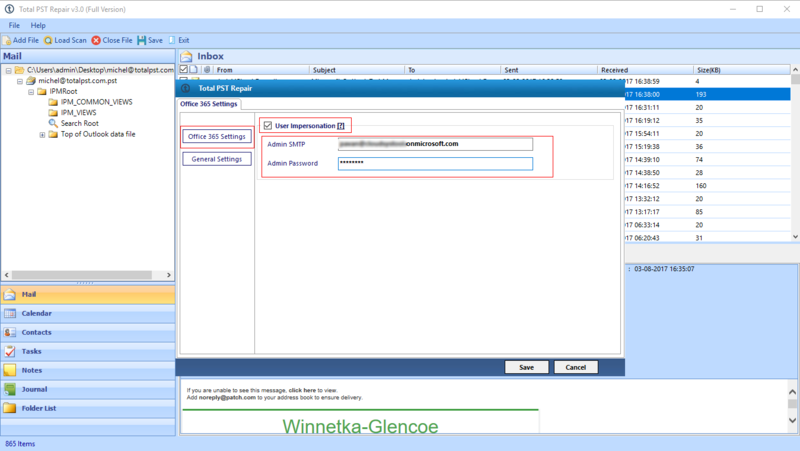 The application not only recovers deleted Outlook PST file items, it also repair PST file which are highly corrupted and inaccessible in your Outlook (2003 / 2007 / 2010 / 2013 / 2016 / 2019) account. For this, the user needs to select Advanced Scan mode option in the software panel. This option enables the utility to thoroughly scan the PST file data items. It then recover deleted data items and repair corrupted PST file efficiently. Download & install Outlook Total PST Repair software to recover deleted PST data & repair corrupted PST file. click on Add File button from the menu bar, then click on Browse button to add PST file into the tool. Software provides Recover Deleted Messages option to recover deleted data from PST file, you can also use this option to repair PST file which are severely corrupted or damaged. Click on Add file button. Now Total PST Repair toolsoftware start scanning the PST file. The software recover deleted data items and it repair PST file during this process. Click on Yes button to save scan. This option will help you load PST file without scanning later. In the left panel, you can view all folders list. 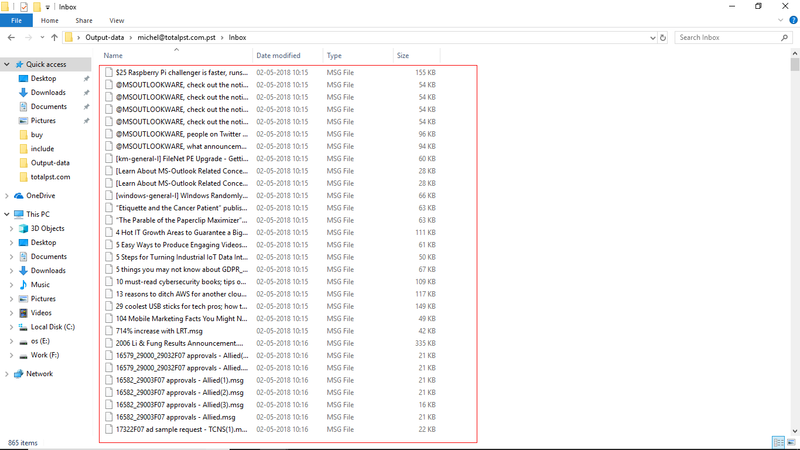 it displays folders with data items in bold font. Note: The user can add new or more PST files one by one by clicking 'Add PST' option in the top bar agian. Now, you can preview all email data with their attachments.. The Repair PST software provides two options Mail View & Attachment View. Mail View – Select a mail to get the Normal view of email data. You can also get the preview of the items like - Calendar, Contacts, Tasks, Notes, journals etc. 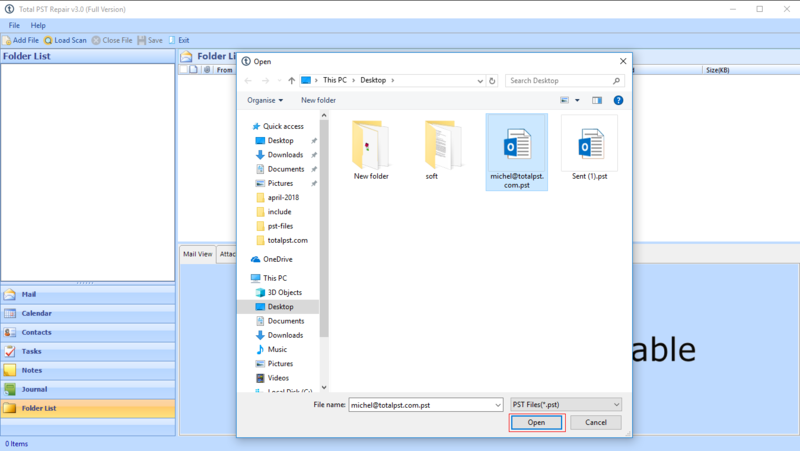 Now hit on Save button to store data items after you complete repair PST file process. 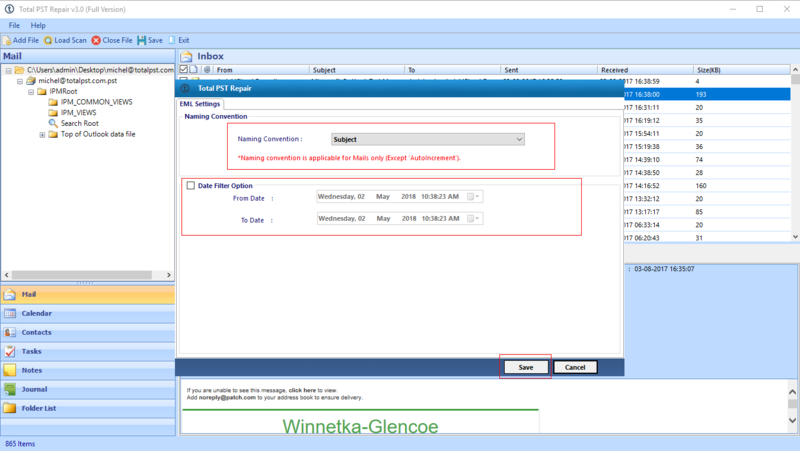 Now, check the folder which you want to save in PST, MSG, EML, & Office 365. Note: User can export multiple PST file data items together in various different file format by clicking Export option and check all the required PST file from loaded files. To save data into PST format, click on PST radio button. 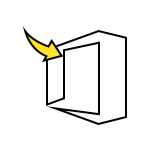 The Total PST repair tool provides some advanced features, to access these features you need to clicking on Advanced Setting button. 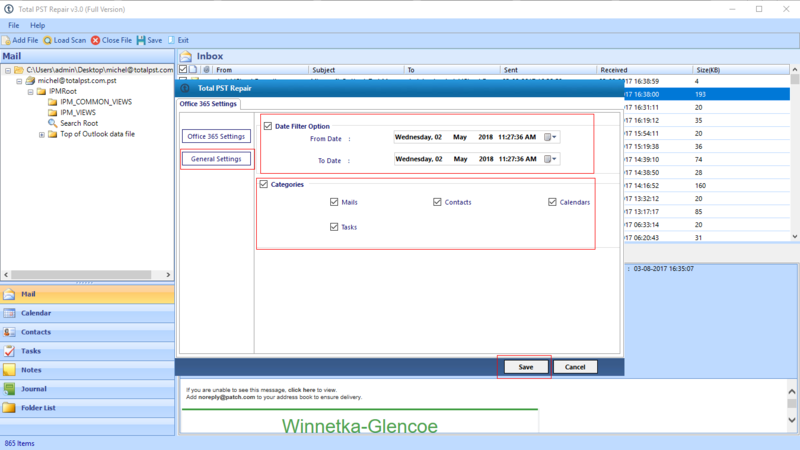 1: Split Option – This option will help you to manage large output file. 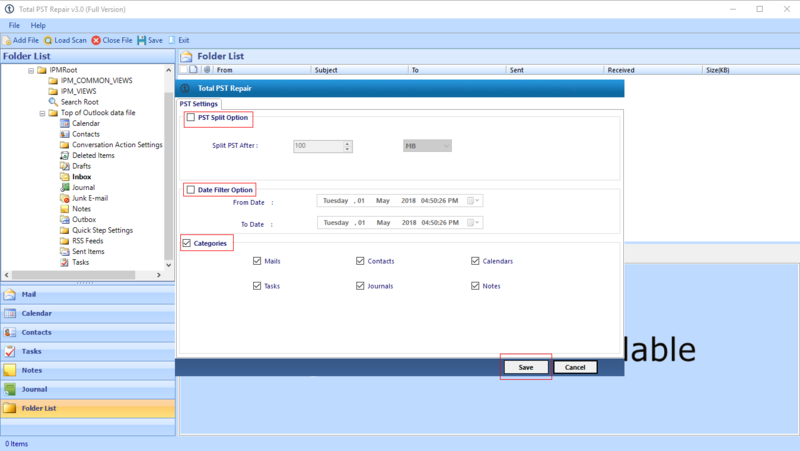 2: Date Filter option – This option allow to save specific data in PST file. 3: Categories – With this option, you can save data according to given categories. After selected options according to the requirement, press Save button. Now, click on Browse button to select destination location to save repaired corrupted PST file. Select the destination location & The Repair PST utility will dispaly a messgae pop up. Hit the OK button. 1: Ignore System Folders, 2: Use Outlook 3: Maintain Folder Hierarchy. 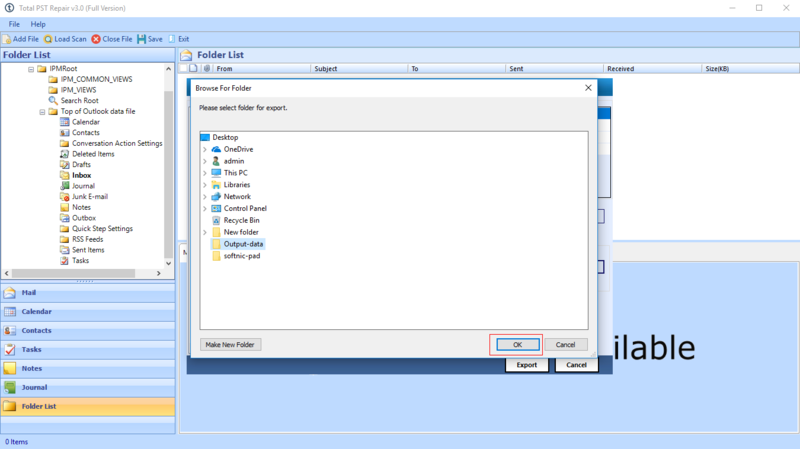 Ignore System Folders – Check this option if you do not want to maintain system folders. 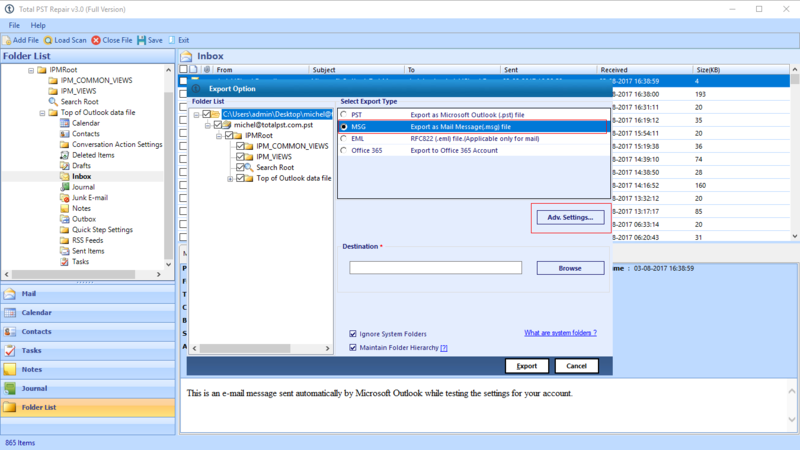 Use Outlook – Check this option if Outlook email application installed in your system, Otherwise uncheck this option. Software start exporting process in PST file. It generate a new PST data file. 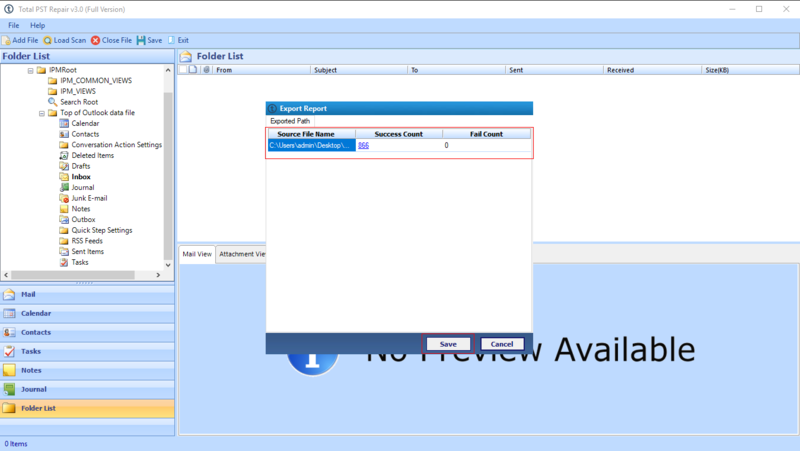 The Total PST Repair tool successfully completed the repair PST file process and exporting process, and it display success count. Select destination location for the report & press save button. Select folder and select MSG radio to save data into MSG format. For advanced setting click on Adv Settings button. Naming Convention – You can select naming convention for converted file, this option is applicable for emails. 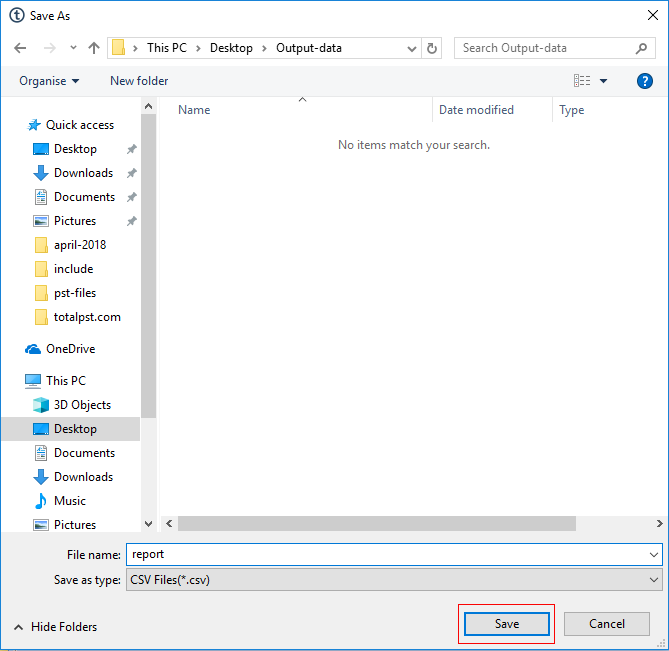 Date Filter – Option to save only specific data. Categories – You can check & uncheck categories it includes mails, contacts, calendars, tasks, journals, notes. Hit on the Save button, Now settings saved successfully. Now, Browse the destination location to save repaired corrupted PST file. Save all repaired PST files successfully. Now press OK button. Display success count. Click on Save button to save the report. Now you can access converted data from the provided destination folder. Select EML radio to save data into EML file.For advanced setting click on Adv Settings. Naming Convention – This option provides Subject, Subject + Date, From + Subject +Date naming conventions. 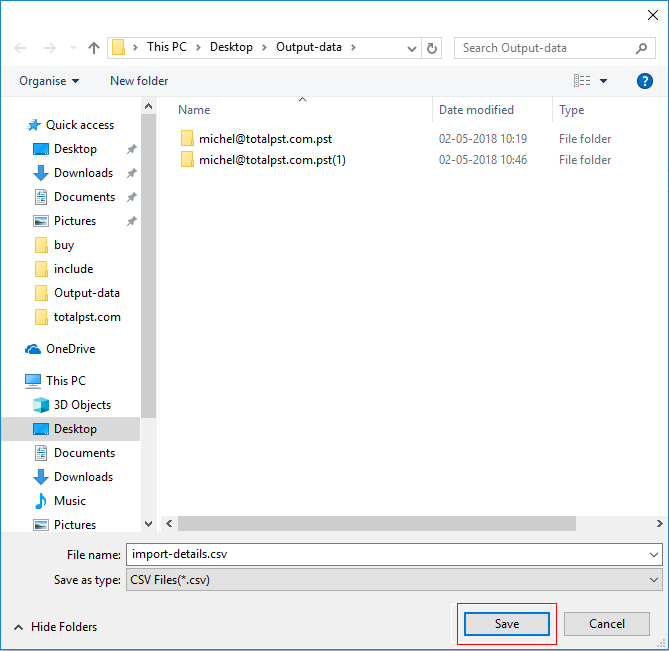 Date Filter – This option to save data of specific date range. Select option & click on save button. Setting successfully saved now choose OK button to finish the process. 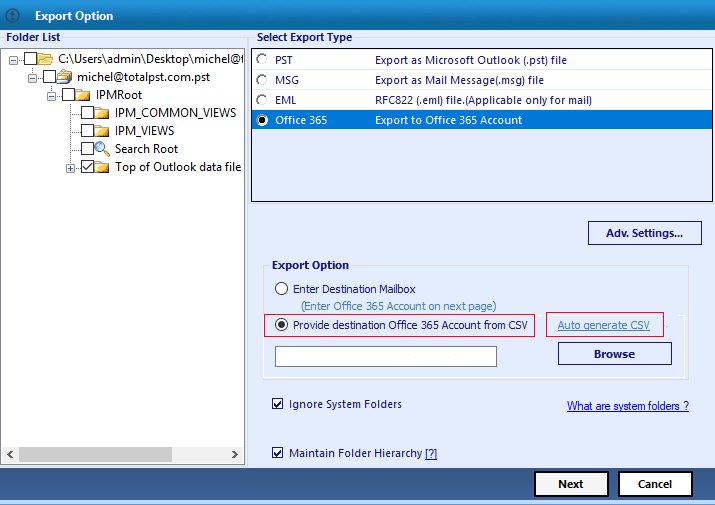 Now browse the destination location to store pst file that are repaired & click on Export button. Now Total PST Repair software starts the process. Process successfully completed. press OK button. 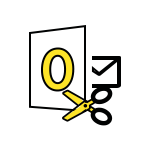 Now Outlook PST repair tool display success count. To save report by pressing save button. In destination location, you can access saved data. 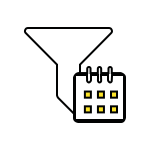 Select Office 365 radio button to save data in Office 365. For advanced setting click on Adv Setting button. 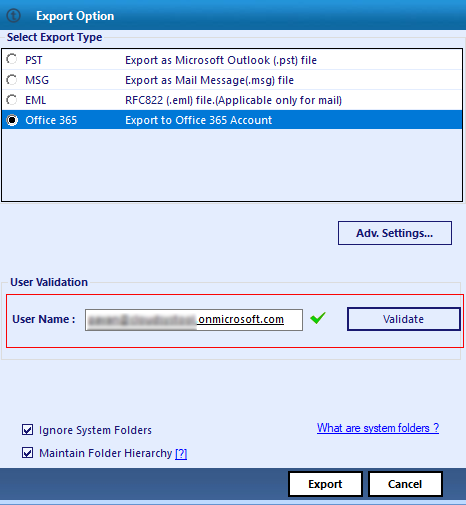 In Office 365 Settings - Check User Impersonation option, This provides Admin SMTP (Admin User-Name), and their Admin password. In General Setting - The software provides two options - Date Filter Option, Categories. Date Filter option – Allow you to save only specific data. Categories option – To save the data as per the folder such as Emails, Calendars, Contacts, tasks, notes etc. After selecting options click on the Save button. Setting saved by hitting on OK button. Now enter the username & password. Click on validate button. Then click on Export button to start the process. Now Total PST Repair tool to repair PST file will start exporting procees. When user gets process successfully completed message pop up, and press OK button. 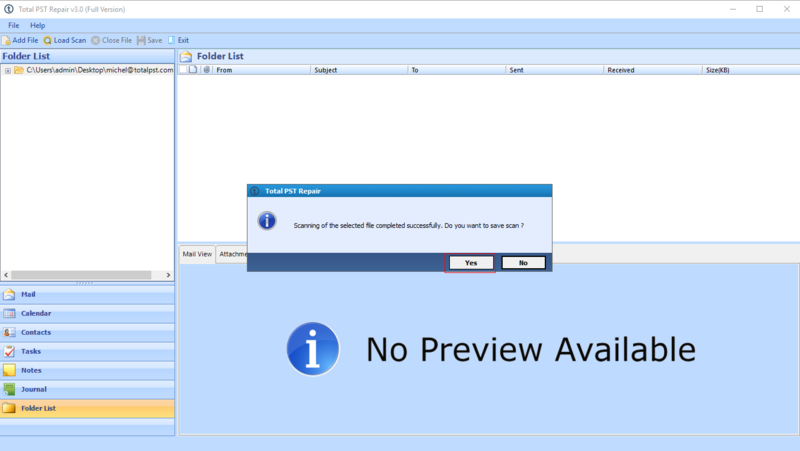 Now PST recovery application display success count & fail count and allow to save the report. To save the report you need to click on Save button. 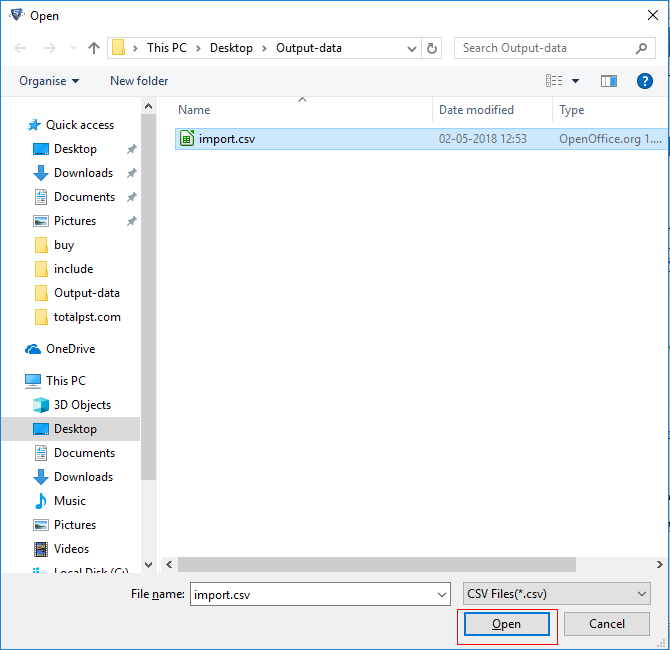 You can also use csv option to save data in Office 365. To use this option you need to click on Auto generate CSV. 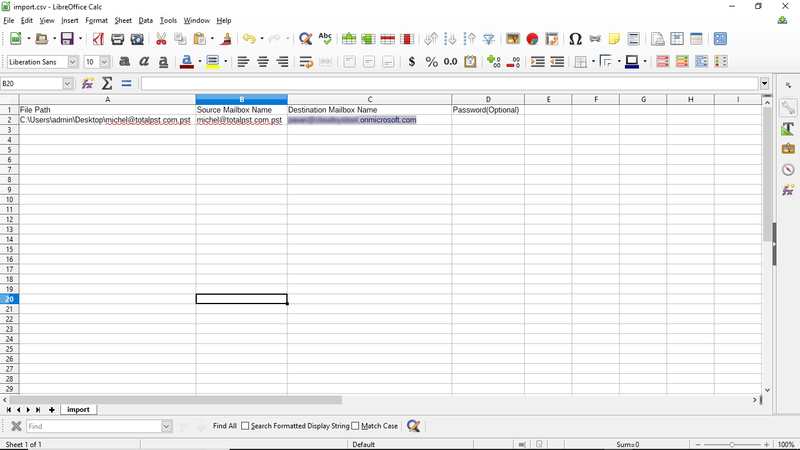 Click on Auto-generate CSV option. Now save this file by clicking on save button. Now open the CSV file & provide the required credential (destination mailbox name). Now click on Browse button. Select the CSV file & click on Open button. Then click on Next button. Now software validates the data, after that click on Export button. Software start the process exporting repair PST files into Office 365 account. When Process successfully get completed, hit the Ok button. 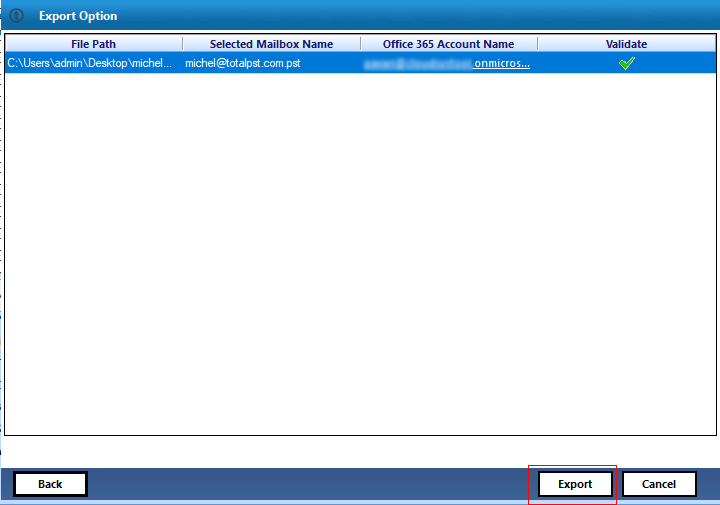 Now you can access the data that is fixed by Total PST repair tool to repair PST file in your Offce 365 account. After using this Total PST Repair software, I can easily say that it is one of the best utility to recover Outlook PST file data that I have tried till date. I have completed recover and repair PST file data in just a few numbers of clicks. Thanks to the developers for such a great application. 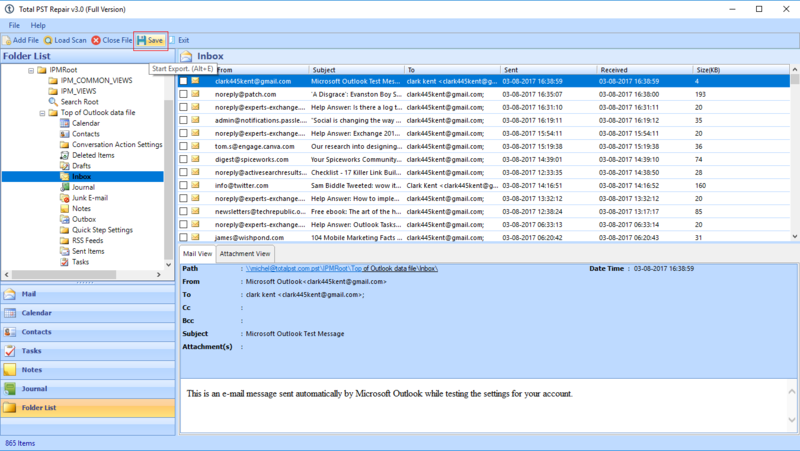 This tool is really helpful to recover deleted items from Outlook PST. 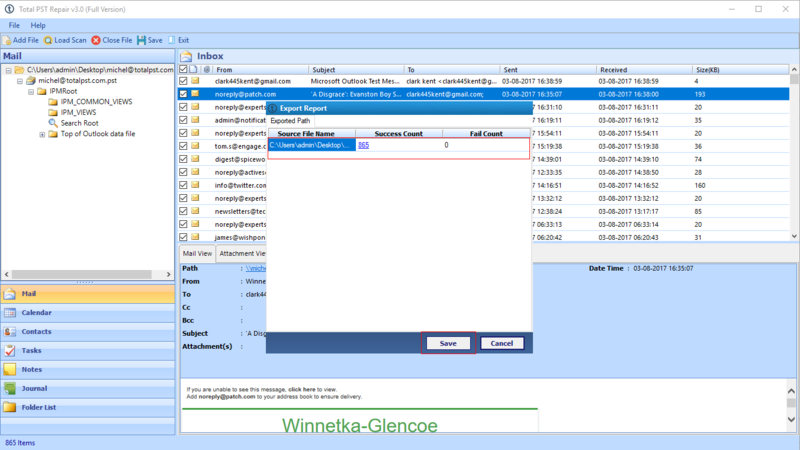 This software helps me to repair corrupted Outlook PST file & recover Outlook 2019, 2016, 2013, 2010, 2007, 2003 PST data item items (emails, contacts, calendars, tasks, notes etc). Hope to see some more products like this by you in coming future. Repairing corrupt PST file without any loss of data is not at all an easy task to perform. When I used this Outlook Recovery tool, I was so amazed. I never thought that repairing Outlook PST file that are severely corrupted and inaccessible in Outlook account would be so easy. According to me, Total PST Repair Tool to repair corrupted PST file is an ingenious application. 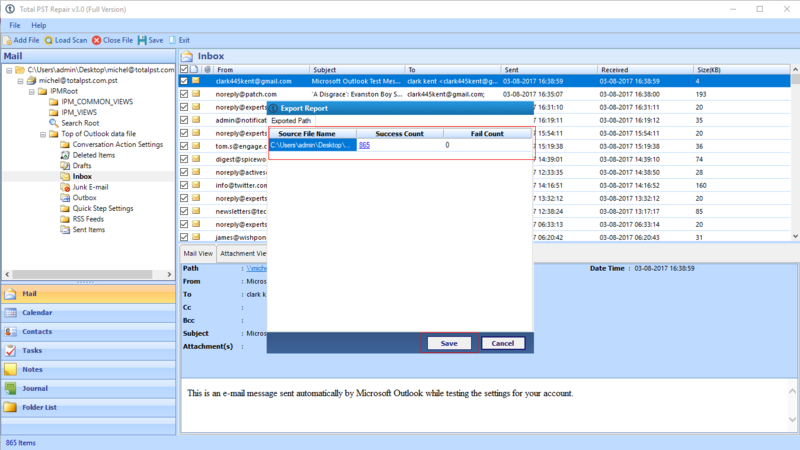 It can also recover deleted Outlook PST file data items. Hats off to the development team.